Experience matters when it comes to commercial roofing. The number of years that a contractor has been in the business is a good indicator of their quality of work. New companies may come to the table with a breadth of previous experience, but it can take years to become financially solvent and to develop processes that ensure true customer satisfaction. If a company installs a roof and goes out of business the next year, warranties and maintenance contracts are put in jeopardy. Always choose a roofer that has at least a decade of proven work experience under their belt, and be sure they have operated under the same business name during that time. It is also important to choose a roofer with experience working on buildings similar to your own. A company that mainly works with single-story, suburban retail buildings, for example, would not be the best choice to work on a high-rise with tenant access. Study the roofer’s portfolio to compare their past projects with your own. When can the project start? Will you have access to all of the extra equipment needed for the work? Do you currently have enough people on staff to get the job done in the allotted time? A bottom-line bid is not always an indication of capacity to do the work. Be sure to ask these questions to ensure your project can start and end in a timely manner. Safety should be just as much of a priority when choosing a roofer as budget. There cannot be enough said about keeping the workers on the roof safe from hazards and keeping the tenants and general public safe, as well. Ask direct questions about a roofer’s safety record. They should have this data on file, and should be willing and able to present it as part of their bid presentation. 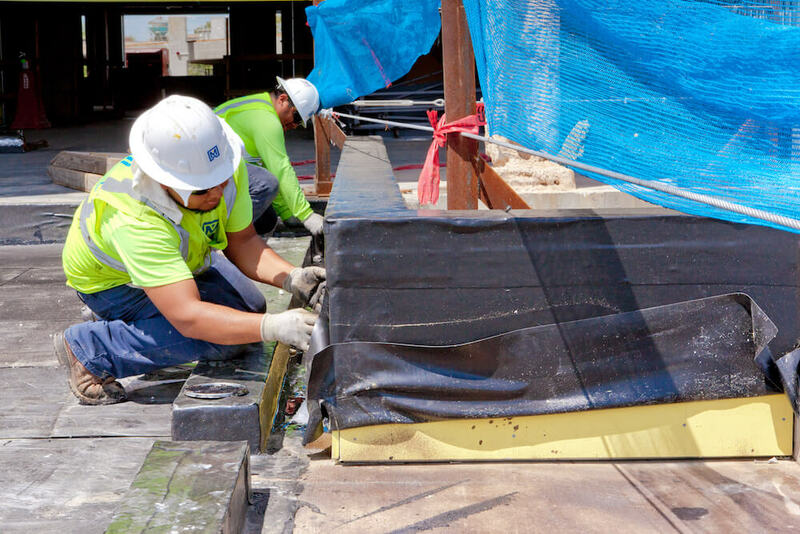 The way in which a roofing contractor manages safety can be a strong indicator of how the entire project will be managed. Quality can and should be the deciding factor when you have several bids that come in at the same price, and the experience and safety record of the contractors all seem equal. The communication process with the contractor before, during and after construction. The workmanship of the finished product. The work ethic of the team. A roofing project that is rife with issues can draw out the length of construction, can lead to unforeseen added expenses and a host of other issues down the line. While the price of the roof is important, the quality of the roof and the value proposition of the contractor should be given significant weight. Commercial roofing projects can easily fall into the $100,000-plus range. When spending that kind of money, building owners and property managers must perform their due diligence. Take the time to ask questions to a roofer before hiring them. A proper vetting process is the best way to ensure satisfaction with the end result.